Today is the last day of April, where did this month go??!! But what I really want you to know is that today is the last day to get over $225 worth of Close to my Heart products for only $49!! Everything to meet your crafting and career needs. Approximately $155 in retail value! A couple of questions you might have that I can answer for you about discount/commission and what are minimums? You can earn extra money by receiving 22% and up to 35% commission on your sales and personal purchases. You can also receive SPC (Select Product Credit) after selling $150/month. If you sell over $1000/month you can earn additional override commission. The minimums are not very hard to meet either with these wonderful products! If you want to join as a hobbyist, that's when you join just to get the discount on the products you love, or as to build a business, that choice is yours. The calendar quarterly minimum is $300. If for some reason you are not able to meet that $300/quarter, than you will drop to a Junior Consultant and will receive a 10% discount. The minimums you must meet while a Junior Consultant are only $100/quarter. If you have dropped to Junior Consultant but get your sales back up to the $300/quarter, then you become an active Consultant with the 22% discount again. To make this deal even better, since you are signing up in the middle of a quarter, you do not have to meet your $300 minimum until the end of September! Email me with any additional questions you might have or go here on my website to get signed up and join my team today before this great offer is done!! You won't be sorry that you did! Close to my Heart is such an amazing company with amazing products! This past week our PTA held Teacher's Appreciation Week. I am on the board as the Membership VP and it so nice to be able to honor our teachers & staff! PTA hosted a luncheon at all 3 elementary schools. We collected prizes from local businesses which were given out as door prizes while they ate their lunch. We also had snacks for the staff in their break room all week. I made personalized note cards for my sons teachers. This was a personal "Thank You" from our family to Mrs. Scott & Ms. Hari. 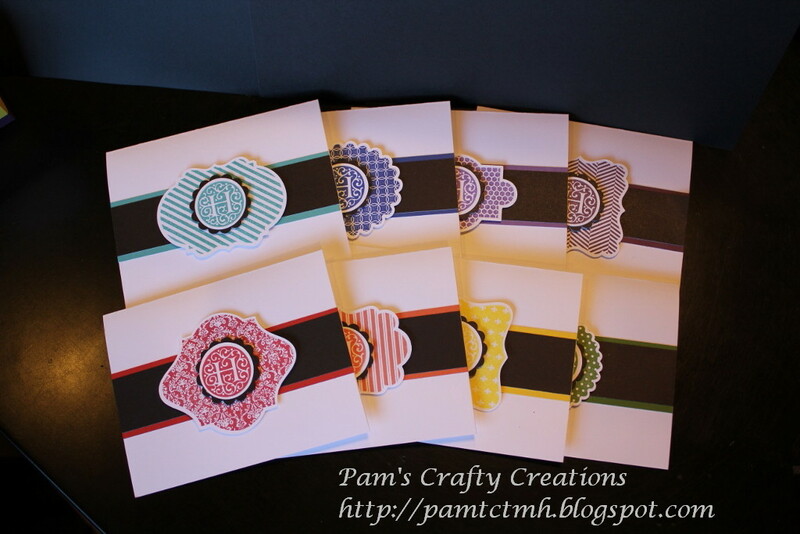 Below is a picture of the note cards I made. 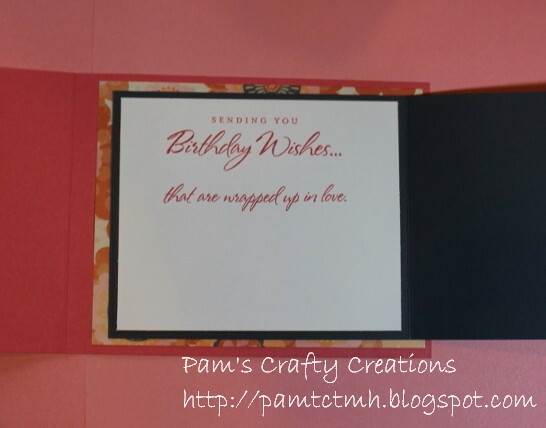 This only shows one set, because I forgot to snap pictures of Mrs. Scott's cards before I delivered them to her, oops! 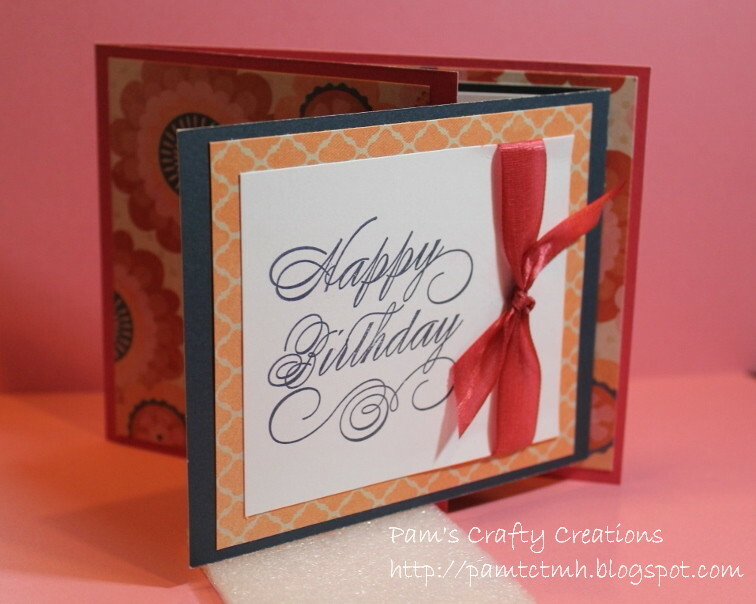 Card were made using a rainbow of cardstock, "H" Monogram Stamp Set and Perfect Fit Frames 1 & 2 Stamp Sets. I used Art Philosophy & Artiste Cricut Cartridge for the Perfect Fit Frames & the scallop and plain circle for the monograms. The magazine rack holder was made using the Artiste cartridge in our school colors purple & gold & retired Thoughtful Tidings February SOTM stamp set. You have to watch this latest Corporate video featuring Kristine. 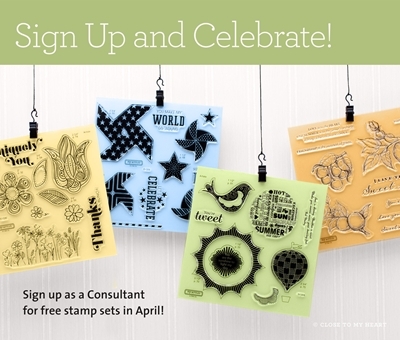 She starts out showing some of her favorite stamp sets that coordinate with the newest Artiste cartridge. The Frame Flair set is one that I used on my last class layout, and it is so wonderful and versatile with four beautiful frames. 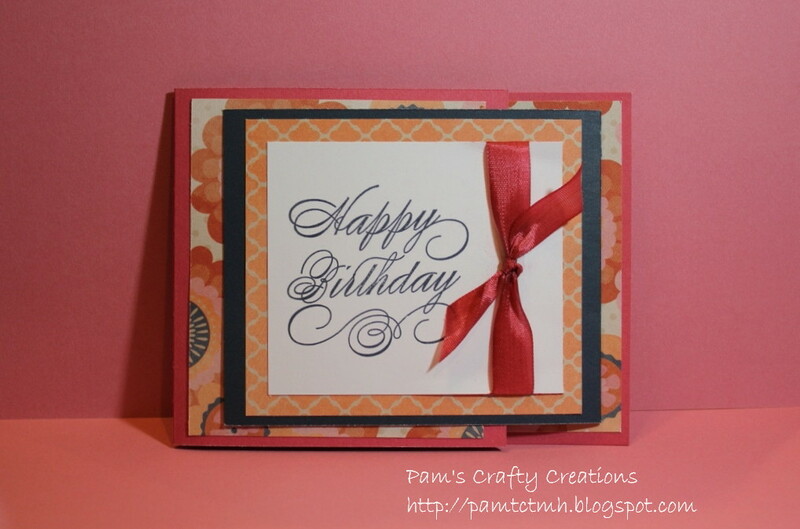 I have also used the Perfect Fit Frames set, definitely one of my favorites! I'll be sharing one of my latest creations using that set very soon. But for now, sit back and enjoy this video! It is a little long, but so worth the time spent watching it! My class layout for this month was made using Chantilly papers with an Easter or Spring theme. I made my first layout using the paisley floral side of the Chantilly papers with a Cotton Candy cardstock mat of my niece hunting eggs at our house back in 2002. The next layout I made planning on putting pictures of my boys hunting eggs this Easter. 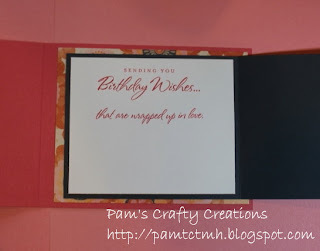 I flipped the scalloped circle over to the green side and used Twilight cardstock for my mat. Supplies used all CTMH unless noted. Cotton Candy, Twilight, Buttercup & White Daisy cardstock. Until my next post, happy crafting & happy Monday! I saw this Fancy Fold Flip Flap type of card posted on fellow Consultant, Jen Patrick's Roxybonds blog and thought it was so cute. I knew I had to make one, so I figured out the measurements and created it using Claire papers. I was just recently reminded of an update from our Corporate office by a fellow Consultant, so I wanted to share this information with you, my customers. The following was in a weekly update email regarding Changes to Product Lines. With the release of a new Idea Book, we also strive to apprise you of key product lines that are being featured in the Idea Book for the last time. While we do not provide early notification on all products, we provide you this selected information so that you can better anticipate changes to core product lines and communicate with your customers. The Spring/Summer 2013 Idea Book is live until the end of July, which is still a ways off, but I know a lot of my customers like to plan out their orders ahead of time, so I wanted to share this information with you to keep you informed! If you do want to order any of these items before the end of the Spring/Summer catalog, please use the following links. You can go here or click on one of the following pictures to go directly to my website. You can go here to order the Button Assortments or click on the following pictures to go directly to my website. Go here to order the My Acrylix E-size Alphabet Stamp Sets or click on the following pictures to go straight to my website. More While Supplies Last items added! Holy cow, they just added more items to the While Supplies Last section of my website! Someone is doing some Spring cleaning in the Corporate warehouse! Grab them up quick before they are gone! !